Contains a special formula based on selected, high quality proteins. 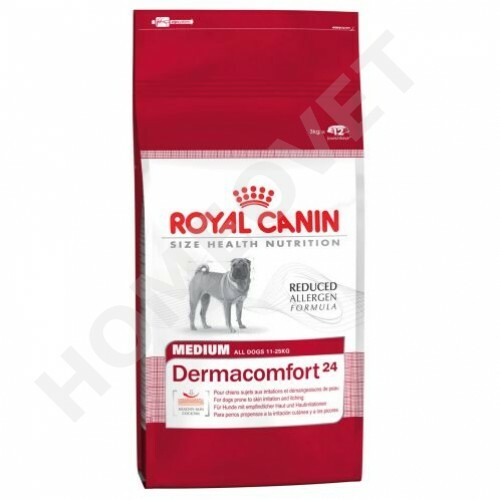 Dermacomfort is especially suitable for dogs with sensitive skin and skin irritations. A special combination of nutrients (patented formula) to support the barrier function of the skin. With omega-6 fatty acids (including gamma-linolenic acid) and omega-3 fatty acids (including EPA and DHA), which are known for their positive effect on the skin. Rice, wheat gluten, animal fat, wheat, corn gluten feed, corn, minerals, oats (peeled), chicken liver (hydrolysed), soya oil, beet pulp, fish oil (source of EPA and DHA), flax seeds, fructo-oligo-saccharides, borage oil (source of gamma-linolenic acid ), marigold extract (source of lutein). Protein (%) 24 Building materials of the body, formation of connective tissue, muscles, etc.